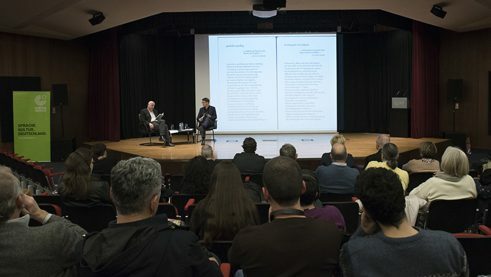 On the occasion of Athens being appointed the world capital of literature, poet Jan Wagner, together with his translator and fellow poet Kostas Koutsourelis, presented an anthology of 25 poems at Goethe-Institut Athens. In the interview he talks about German-Greek relations, what awards mean to him and the form and structure of a poem. It is the first time that your poems are being translated in Greek. Any thoughts and feelings given the occasionally strained relationships between Greece and Germany? As far as poets are concerned, Greek or German or, for that matter, of any other country or origin, there have never been any tensions and never will be - except perhaps on a purely personal level. Fortunately, writers across Europe, not least the poets, are engaged even now in a constant exchange and a process of translating each other, of learning from other traditions – just the way, I assume, what Goethe envisioned when he coined the term “Weltpoesie”, that is, “world poetry”. Regardless of the countries, poetry is usually regarded as the most neglected and deprived literary genre. As you’ve said, poetry is at best considered as an “adorable anachronism”. Has it always been like that and why? Well, poetry has very seldom become the literary genre that was read by a majority of the readers, although even that has happened, if you consider the audiences that Pablo Neruda read for, or if you have a chance to witness the stunning audiences that to this day gather for poetry readings in some places in South America. Then you realize, that it will happen again elsewhere, too. 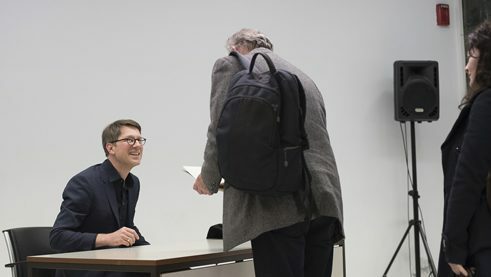 In fact, in Germany, which for me is easiest to relate to, poetry, for the past fifteen years or so, has had such an exciting output, so many extraordinary young poets have emerged during the last decade, that slowly but surely the public is growing to take heed of this phenomenon as well. You were recently awarded the prestigious “Georg Büchner Prize”. Do prizes like that help to bring poetry and poets in the spotlight, do they make poets shy or none of the above? Prizes like these surely make a larger number of people aware that poetry is still being written today, and they may also help diminish certain prejudices concerning poetry that stubbornly exist. People may tell themselves that it might be worthwhile after all to purchase a collection of poetry after all these years of neglect. What’s the relationship between the contemporary “common reader” with poetry, in a time of too many digital distractions? A poem, I think, can be a sort of sanctuary, an invitation to take a step back from the flurry and the hustle, to slow down and reflect, to take a deep breath – and to accept the poem’s invitation to have a new and unexpected angle on language, on oneself, on the world surrounding us. A poem is always a challenge to think things anew – and therefore a tiny yet powerful entity of extraordinary freedom as well. In what ways is form and structure important in your work? A poem is always formed language and form and content are interdependent. For me it is crucial to have all the possible forms, the traditional forms, that is, all the details of craft concerning metre and rhyme, in the back of my head. It is never to keep a tradition alive for its own sake; rather, all these forms have their own beauty and attractive structure that may help a poem to become more perfect. And most of all it is the fact that the strictness, the corset of certain forms incites to dig deeper, think wider, choose some tracks not considered or even thought possible up to this point. So that paradoxically the formal severity may result in an even greater freedom – and lead to that most beautiful moment of them all, in which the writer of the poem is surprised by his own poem. The interview was conducted by Nikolas Zois. A longer version was published by Greek newspaper TA NEA on 17 March 2018. Jan Wagner was born in Hamburg in 1971 and has been living in Berlin since 1995. His work includes volumes of poetry, essays and reviews, anthologies and translations of contemporary English-language poetry. His work has been translated in about 30 languages. As part of "Athens World Capital of the Book 2018", a bilingual anthology was published by Greek publisher "Kichli". Kostas Koutsourelis translated the poems into Greek.